I want to start off by saying that Rich Amooi books just make me so happy. So when Rachel sent an email about his blog tour I had to snap the chance up quickly to be on it. Then I drove everyone insane for a couple of days on Twitter to get them to sign up and join the tour. (Not that I think it would have been a hard task). Last year before I started blogging, it took me four months to finish a book and I was in such a reading funk. I found Rich Amooi “Five minutes late” and I devoured it in one sitting. The book made me so happy. I adored it and I knew I had to read more! What I loved, even more, is that it is a man writing the books, in a predominately woman orientated genre, to me makes this even better as he got the woman psyche spot on - kudos to you! Fast forward seven months and it was my first chance to pick up another of his books. He has not disappointed me at all! This book is such a cute and easy read. Doesn’t matter you know what is going to happen to the lead characters it is how they get there, that is the fun part. 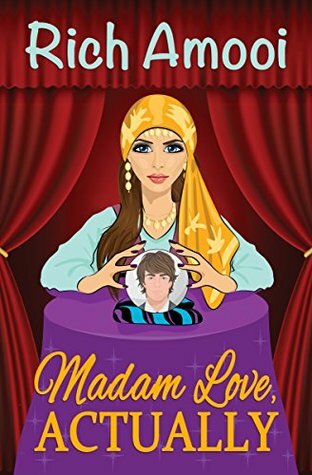 Emma being Madam Love, (actually) finds true love for people by what she sees in her crystal ball. She, however, is not a fraud. She can really find you your soulmate! She guides you to do three things to do and if you do all three you will meet your soul mate. Lance, a non-believer of soul mates, writes a book and calls her a fraud, all because what had happened in the past. Now they have a challenge set live on air, Madam love has to find him a soulmate. Oh, darling what could go wrong. I have also got to do a shout out to a character I loved Typo the dog (and I am a cat person!) he is such a cute dog, and he knew when he saw Emma that she was the one for Lance, especially as he growled at anyone who went near Lance lol. The story with these two was so funny to read! How they ended up in the same places and how she was reading her own destiny without realising it. I am a huge believer of soul mates so I was hooked, lined and sinkered (I know it's not a real word) with this book. The only thing I couldn't get my head around was the whole Superman/Clarke Kent, Supergirl/Kara, Batman/Bruce Wayne (you get the picture), scenario how did Lance not realise it was her! But to be fair, it added to the charm and the zap of the story. I was completely engrossed in this book and didn’t want any interruptions ( blinking lunch breaks being too short) even doing bedtime with the little one, I read it to her because I didn’t want to put it down. It was a welcome read after all the dark thrillers I have read lately, and who can go wrong with a bit of romance! The book was cute, light and non-stop, I loved the banter between the three characters - Emma and Madam Love are two separate people, now come on...keep up. When I read the acknowledgements at the end of the book, I found out that Emma/Madam Love had a cameo in another book...so you know the score right....need me to get on to Amazon and buy Lilliana Jones and the Temple of Groom. Sign into Goodreads to see if any of your friends have read Madam Love, Actually.